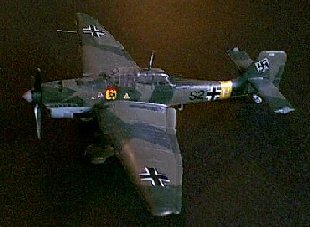 The JU-87 Stuka (short for Sturzkampfflugzeug) is probably on the short list of aircraft that come to mind immediately when a discussion of World War II airpower comes up. A symbol of Germany's early successes and the philosophy of the Blitzkrieg, the sight and sound of this aircraft screaming down brought terror to troops in Germany's way throughout the war, even after its vulnerability was shown in the Battle of Britain. 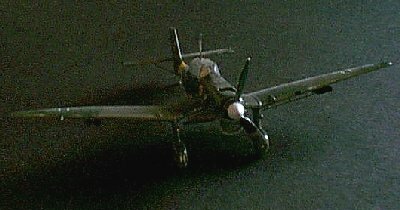 The Hasegawa kit is nicely done, and has been recycled where appropriate for other versions (including a night attacker and a Russian front "tank buster" with underwing Flak cannons.) 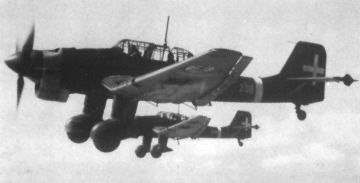 The fuselage is seperated into uneven quarters with the engine compartment seperated.from the main fuselage, allowing for later variants without the need for major retooling. 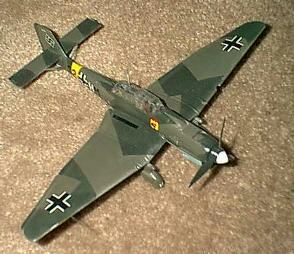 This is a good sized model for a single engine aircraft, and is rather impressive when finished. A mounting for the "sirens" used on some aircraft is included, moulded onto the landing gear legs - two of the versions have you remove these, however. What *looks* like the propeller (?) to drive them doesn't fit, and is not shown in the instructions. Everything fits together relatively well, though you must be careful mounting the nose to the fuselage - it's the only spot I really needed any significant amount of filler. There was a slight mismatch in the fuselage halves, but this may be due to me moving twice before building this, and it was not very significant. One of the wing dive brakes was also warped slightly - again, I suspect it happening during the move. The wings fit together nicely, and fit to the fuselage without a problem - no gap between the wing and fusselage was visible. There are a lot of "fiddly bits" under the wing - leave the dive brakes off until after decalling. My copy of the kit included brass "pins" to replicate the extended fuses on some weaponry. This requires you to file down the nose and drill it out to accept the pins. On the main bomb, this is no problem as the bomb is hollow and can be drilled out with an X-Acto knife. The smaller bombs need to actually be drilled out. I'm not sure yet if the effect is worth it.